Well, this is a little overdue, but as you know, I’ve been in the process of moving the site from DAW-Music.com to DAWCast.com. I ran into a few issues along the way, and ultimately ended up importing the posts into WordPress. That’s right; we’re no longer on Movable Type. 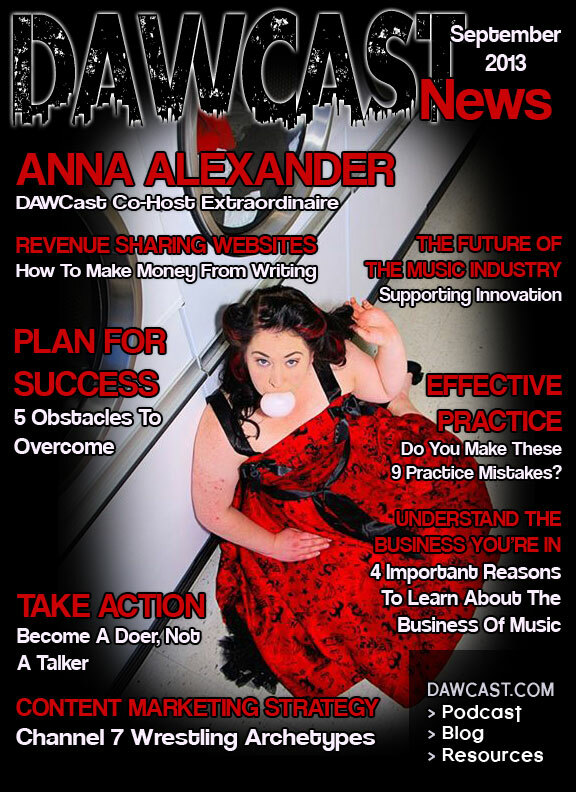 What you see below is the September edition of DAWCast News. Unlike other magazines that tend to come out a month early, I’ve been coming out with mine a month behind, because I like to showcase the best content I’ve created in a month. Either way, I’m going to need to get on the October cover soon. I thought it would be fun to rotate the person on the cover month-to-month. I’m not sure how practical that is time-wise, but I only have so many pictures of myself and I thought it would be a lot more engaging to feature other people too. I don’t actually have a feature on our very own Anna, but you can check out her Twitter profile and follower her if you feel so inclined. This was a rather extensive look into the revenue sharing website, InfoBarrel. For those who are passionate about writing and wouldn’t mind making a little extra change on the side should really check it out. The first step to success is setting a course. Without a plan, you’re like a ship without a rudder. If you have any mental blocks around making a plan for your career activities, this audio is for you. It seems like a lot of people are content to sit back and make fun of others. However, the true spoils will always go to those who are diligent about taking action and moving forward in the face of criticism. This came to me in a flash of inspiration. I can’t say that I’m the most knowledgeable person when it comes to wrestling, but this came together rather quickly. If you like to get a rise out of people with your content, this post is for you. I realize that there are already many articles and blog posts by the same title. The key message in this article was to begin supporting those who are brining change and innovation to the music industry. » Do You Make These 9 Practice Mistakes? Update: this post is no longer online. As an instrumentalist, there are definitely ways of making your practice time more productive. This blog post addresses some of the common issues that can arise as you seek to have a more productive practice session. If you fail to educate yourself about the business of music, you could wind up in a variety of different messes. This blog post underscores the importance of understanding the business you’re in.